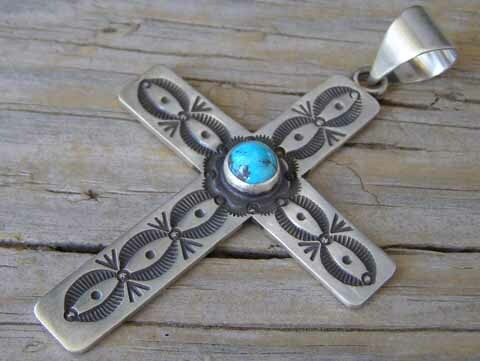 This deep-stamped cross pendant made by Herman Smith is set with a high-domed round stone of natural, untreated Persian turquoise. The stone is set in a smooth bezel and this pendant is lightly brushed to give it a matte finish and an oxidizing agent darkens and highlights the deep stampwork. Wear this on a strand of Erma Arviso's antiqued Sterling beads of 7 mm. or 8 mm. diameter. Hallmarked HS and stamped Sterling on back.